Ford champions its evolving identity: Ford Motor Co. was highly visible last week in its evolving role as a personal mobility company, and not just as a vehicle manufacturer. “People value access more than ownership. We need to understand customers’ concerns and make their lives easier,” Ford CEO Mark Fields said in an interview. Last week, the company announced a pilot carsharing program where 26,000 Ford Motor Credit Co. customers in six US cities and London are invited to offer their vehicles for short-term rentals. It’s part of the Ford Smart Mobility plan that Fields introduced in January; another offering from Smart Mobility will be electric bikes targeted at urban commuters. The bike is able to be folded up and recharged while being stored inside any Ford vehicle. Ford Motor Co. also announced that it’s in the second of three phases of its autonomous vehicle project. Ford executives have said that a number of driver-assist features that represent steps along the path toward a self-driving vehicle will be rolled out across the company’s vehicle lineup over the next five years. Some of the testing Ford will be carrying out on these advanced technologies will take place at its Silicon Valley Research and Innovation Center, which opened in January. One development coming out of this center will be a technology that may be able to produce parts 25 to 100 times faster than traditional 3D printing. Supreme Court rules against EPA on Clean Air Act: The Obama Administration’s health care reform act survived US Supreme Court scrutiny on Thursday, but the 2011 Clean Air Act amendments were overturned yesterday by that same court. In Michigan v. EPA, the court ruled 5-4 that the US Environmental Protection Agency (EPA) underestimated the costs to utilities and other companies on toxic air pollutants. The EPA had previously estimated its rule would cost $9.6 billion, produce between $37 billion and $90 billion in benefits and prevent up to 11,000 premature deaths and 130,000 asthma cases annually. The court ruling found those estimates to be “unreasonably” interpreted and would be much more costly to industries. The EPA ruling had focused on coal-fired power plants, but there’s also been a good deal of concern that manufacturers would be drawn into the rule’s enforcement. “Manufacturers look to today’s victory as a sign of progress and will continue to lead the way to promote a more environmentally sustainable future, but we need a balanced approach to regulations that considers both costs and benefits to continue to create jobs and economic growth,” said National Association of Manufacturers Senior VP and General Counsel Linda Kelly. The EPA says that several utilities were already well on their way to adopting the Clean Air Act guidelines. “EPA is disappointed that the Court did not uphold the rule, but this rule was issued more than three years ago, investments have been made and most plants are already well on their way to compliance,” EPA spokeswoman Melissa Harrison said in a statement. GM jabs at Tesla: While not being overt and blunt about it, General Motors CEO Mary Barra said that Chevrolet’s Volt and Bolt are being made “for regular people, not for the elites.” During an unveiling last week of the 2016 Chevrolet Cruze, Barra also made statements about GM electric vehicles. The Bolt EV Concept car has an estimated range of 200 miles, and like the Volt it will be affordable, Barra said. Earlier that day, GM’s executive chief engineer for electric vehicles, Pam Fletcher, said pretty much the same thing during a breakout session on plug-in electric vehicles. GM will make “electric cars approachable to the all, not just the elite,” Fletcher said. Fuel efficient renewable diesel road trip: History was made by a performance car running on renewable diesel that made its way across the country on one tank of fuel. On June 26th, CLP Motorsports’ Superlite Coupe crossed the finish line in Santa Monica, Calif., after making it across the US on one tank of NEXBTL renewable diesel. That came from an alliance between Neste, the world’s largest producer of renewable diesel, CLP Motorsports, and multiple time X-Games and Rallycross champion Tanner Foust. “We will continue to promote this great fuel through our fleet-servicing and retail stations and of course through our racing,” said Pat O’Keefe, inventor of this project and CEO of CLP Motorsports. The coupe averaged 67 mpg while traveling an average of 68 mph, and that included a segment of the trip driving over the Rockies. Clean transportation information resource: South Coast Air Quality Management District’s Mobile Source Air Pollution Reduction Review Committee (MSRC) has published its quarterly Clean Transportation Policy Update. Read all about California’s administration, regulation, funding, research, and legal activities. Examples of topics covered include the groundbreaking decisions in the state on reaching the greenhouse gas emission reduction target of 40% below 1990 levels by 2030 through Gov. Jerry Brown’s new climate target. More crowdfunding for Elio Motors: As the three-wheeled electric vehicle manufacturer scrambles to survive and thrive in the market, founder Paul Elio’s funding activities have become even more ambitious. Elio needs to raise about $230 million more to start manufacturing its vehicle in a four-million-square-foot former General Motors plant in Shreveport, La. Elio is offering early-stage investments on the Start Engine site. That investment has been made possible through the JOBS Act of 2012. This legislation permits individuals to invest up to $15,000 in startup companies; these companies are allowed to accept up to $50 million from non-accredited investors. Propane bi-fuel system: The US Environmental Protection Agency (EPA) has granted certification to Imega International USA’s GAME bi-fuel propane autogas/gasoline system. The approvals cover the 4.6-liter V8 engine line-up for the model-years 2009, 2010, and 2011 Ford Crown Victoria, Lincoln Town Car, and Mercury Grand Marquis. Imega is in the process of EPA certifying many popular fleet platforms to be available soon, the company said. More OEM energy storage: Daimler and Nissan are following Tesla Motors’ lead after that luxury electric vehicle maker introduced its PowerWall in late April. Daimler and Nissan say they’ll be bringing similar products to the commercial and residential energy sectors. Daimler is offering a storage plant of up to 20 kilowatt-hours that will begin shipping in September. The next week, Nissan announced it will deploy second-life vehicle batteries for commercial energy storage markets through partner Green Charge Networks. Sustainable Transportation Day: The US Energy Department’s Office of Energy Efficiency and Renewable Energy (EERE) hosted the Sustainable Transportation Day at the Energy Department’s headquarters in Washington, DC. Visitors had the opportunity to see first-hand several of these EERE-supported technologies, ranging from high-efficiency internal combustion engines to vehicles that rely on electricity and hydrogen. The Hyundai Tucson and the Toyota Mirai fuel cell electric vehicles were among the vehicles on display. Having access to incentives for vehicle acquisitions and infrastructure continues to be a critical part of moving clean transportation technologies forward with consumers and fleets. A recent study by Navigant Research of 1,002 US consumers found some not-so-surprising results on incentives and how they affect electric vehicle purchases. A webinar presented last week, “Fleet Incentives for Clean Vehicles,” offered the latest on available resources. Kevin Wood, Project Manager, at San Diego-based Center for Sustainable Energy, moderated the panel and discussed the Advanced Transportation Center. Advanced Transportation Center is led by the Los Angeles Economic Development Corp. in alliance with the Center for Sustainable Energy and with the Advanced Transportation Center of Southern California (which is based in Los Angeles and works with the e4 Mobility Alliance). The groups are working together to launch virtual and physical center locations, and to outreach to key industry stakeholders and end users. They’re also educating these communities on statewide incentive programs, air district grant programs, federal tax credits, technical assistance, and resources available through Clean Cities Coalitions. You can find more information at the organization’s website. Randy Wilde, Clean Transportation Project Associate at Center for Sustainable Energy, talked about the Clean Vehicle Rebate Program (CVRP) that the center is offering in coordination with the California Environmental Protection Agency and the California Air Resources Board; and which is available to public and private fleets. Post-delivery rebates are available on electric vehicles (EVs) bought or leased statewide, including: $5,000 for fuel-cell vehicles; $2,500 for all-battery EVs; $1,500 for plug-in hybrid EVs; and $900 for neighborhood and motorcycle EVs. There’s about $25 million remaining in available funds for fiscal year 2014-2015. Funds are available for fleets in California or that have a California affiliate. You can visit this website to choose an eligible EV and apply for a rebate. Wilde said that rental and car-share fleets can access a special reduced ownership provision, offering: $1,500 for fuel-cell vehicles; $750 for all-battery EVs; $450 for plug-in hybrid EVs; and $270 for neighborhood and motorcycle EVs. Increased incentives are now available to state and local public agencies through the new Public Fleet Pilot Project in disadvantaged communities. These incentives include $15,000 for fuel-cell electric vehicles, $10,000 for battery electric vehicles, and $5,250 for plug-in hybrid electric vehicles. Public fleets can also find out about eligibility for this program through CalEPA’s CalEnviroScreen model at this site. 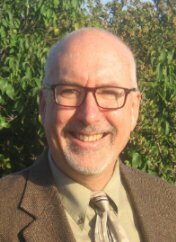 Ted Bloch-Rubin, Associate Project Manager at CALSTART, talked about the California Hybrid and Zero-Emission Truck and Bus Voucher Incentive Program (HVIP). The HVIP’s goals include responding to a question that usually comes up for fleets – how to address the high incremental cost of medium- and heavy-duty advanced trucks. This program does alleviate some of that concern with attractive incentives – including $95,000 vouchers for vehicles over 26,000 pounds in gross vehicle weight rating (GVWR) outside disadvantaged communities when acquiring one to 100 vehicles; $110,000 per vehicle for these heavy vehicles operating within disadvantaged communities and purchasing one to 100 vehicles; and $45,000 per vehicle when purchasing one to 101 to 200 vehicles. Medium- and heavy-duty trucks and buses are included in the program at ranges starting with 5,001GVWR. Voucher enhancements have been added for serving disadvantaged communities, which tend to be affected by higher concentrations of air pollution. Bloch-Rubin discussed vehicles being acquired by fleets in HVIP including trucks offered by Electric Vehicles International (EVI) and Smith Electric Vehicles, and electric buses available through Proterra and BYD. Hybrid vehicles available through the program include models manufactured by Hino Trucks, Altec, and Autocar. Hybrid vehicles are taking off in popularity with smaller fleets – the largest groups participating in HVIP for hybrids are in the one-to-nine vehicle programs. Hybrid conversions, such as vehicles offered by XL Hybrids, will be available in the fall of 2015. Craig Rindt, Assistant Director for Research Coordination, Institute of Transportation Studies (at UC Irvine) provided an update on the development of the new California Energy Commission (CEC)-funded Natural Gas Vehicle Incentive Project. The specifics of the project have not yet been announced by CEC, but they should be of interest to statewide fleets that have been substantially deploying natural gas vehicles and refueling infrastructure for several years. A public workshop seeking input will be held soon and guidelines are expected to be released soon on the Natural Gas Vehicle Incentive Project. This will be available by CEC as part of the Alternative and Renewable Fuel and Vehicle Technology Program (ARFVTP). That program’s objective is to provide incentives that will directly benefit California’s economy and the environment by expanding the use of a domestically produced non-petroleum fuel that is a low-cost alternative to gasoline and diesel. Institute of Transportation Studies (ITS), Irvine, will work with CEC to administer the project. There’s also a research component, where ITS Irvine will be conducting research on the natural gas vehicle market through enhanced data collection, a survey of end-users, and GPS and OBD data collection for a subset of end-users. The study will also explore natural gas vehicle market dynamics and market success conditions. During the webinar, participants were asked to respond to quick survey questions. One question dealt with adopting emissions reduction goals. Seventy percent of webinar viewers said yes, 20% are planning to implement clean vehicle goals, and 10% don’t have these goals in place. For fleet managers participating in the webinar, 47% have plug-in electric vehicles, 58% use natural gas vehicles, 61% have hybrid vehicles, and 3% have fuel-cell vehicles. To view a recording of this webinar, visit this site. To view the webinar slideshow, go to this site. 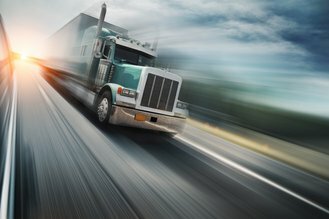 Phase 2 of commercial truck rules: A long-awaited ruling on medium- and heavy-duty trucks on greenhouse-gas emissions and fuel economy has been released by federal agencies. The US Environmental Protection Agency (EPA) and National Highway Traffic Safety Administration (NHTSA) are proposing emissions and fuel economy improve by up to 24% through 2027, and federal efficiency standards for new trailers have been included for the first time. The proposed second-phase rules on vehicle and engine standards would run from 2021 through 2027 and apply to semi-trucks, large pickup trucks and vans, and all types of buses and work trucks. Emissions and fuel consumption from heavy-duty pickups and vans will need to be reduced by 16% between the 2021 and 2027 model years, according to the federal standards. As for feedback on the ruling, American Truck Dealers voiced concern that’s been heard for years from truck makers and suppliers – about the higher costs of compliance and economic impact if prices for commercial trucks rise. Fiat Chrysler’s FCA said it “supports and commends” the coordinated approach taken by the federal agencies. NGVAmerica and its member companies commend the rule, as does CALSTART. 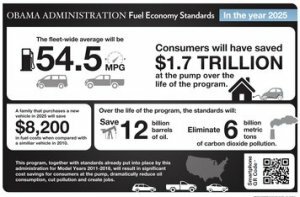 The Consumer Federation of America released results of a survey conducted in mid-May with more than 1,000 US consumers; 71% favor increasing fuel efficiency mandates for heavy-duty truck, while 24% oppose it. As for federal rules on light-duty passenger vehicles: The National Research Council (NRC), an 18-member committee nonprofit group that advises federal policymakers, found that the federal 54.5 mpg by 2025 model year standards are based on sound assumptions on its technological progress and costs – even if electrified transportation doesn’t hit high sales volumes. The NRC study also expressed concern over how much consumers will be willing to pay for the fuel-efficient vehicles. The report comes out during a time when automakers, environmental groups, and regulators are determining the final federal fuel economy standards from 2022 through 2025. This midterm review process was demanded by automakers before they make the investment in retooling to reach the high mpg and emissions targets. Fisker Karma coming back: Fisker Automotive and Technology Group will be working out of a manufacturing plant to relaunch its Karma plug-in hybrid electric vehicle in Moreno Valley, located in California’s Riverside county. Fisker will create 150 new jobs, with about 100 of them being engineers. The company is also looking into keeping a portion of its former Anaheim headquarters. Chinese owner Wanxiang Group had promised to utilize Fisker’s Delaware plant, but the future of that plant has yet to be determined. Watch these videos: NAFA’s past president Claude Masters and CALSTART’s Bill Van Amberg talked to Fleet Management Weekly in these video interviews about NAFA’s Sustainable Fleet Accreditation Program and hitting clean transportation targets. Masters talks about the programs being set up to provide data fleet managers need. Van Amberg says that the true role of CALSTART is to build a clean transportation technologies industry – creating jobs that, in turn, create cleaner air. Ford land-fill free in Mexico: Ford Motor Co.’s Hermosillo Stamping and Assembly Plant has earned zero waste-to-landfill status, making the automaker landfill-free at all of its Mexico manufacturing facilities. That means Ford’s Mexico plants are diverting 1.5 million pounds of landfill waste this year and going forward. 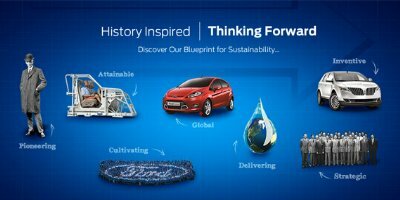 This is part of a global campaign by Ford to reduce waste-to-landfill by 40% per vehicle produced from 2011 to 2016; Ford previously hit that target by reducing global per vehicle waste-to-landfill by 40% from 2007 to 2011. Toyota might gain more ZEV credits in California: Toyota is not getting out of the plug-in business entirely to focus instead on hydrogen fuel cell cars. Developed with the new 2016 Prius hybrid, the new Toyota Prius Plug-in Hybrid will likely have longer electric range than its 11 miles on battery only in the current version. That will probably help tip the scales a little bit more in the automaker’s favor in California. The state is loosening up on its zero emission vehicle (ZEV) credits, and Toyota will be able to gain more credits if it sells more of these models than it’s been achieving lately. The 2016 model could generate that enthusiasm and sales increase, and could be a way for other companies to meet their targets. Mazda and Subaru, for example, will fall under ZEV requirements for the first time starting in 2018 and might be interested in buying Toyota’s technology for their vehicles to meet the targets – similar to what Toyota had previously done with Tesla Motors in its RAV4 EV. Nevada wants to see Electric Highway: Nevada Gov. Brian Sandoval announced that five new electric vehicle chargers will be placed on highway US 95 in between Reno and Las Vegas; that will go with the 150 charging stations already in place in the state. State officials are working with Tesla Motors to set up additional fast chargers, Tesla Superchargers, along the Nevada Electric Highway. That’ likely to happen given that Nevada will soon be home to Tesla’s Gigafactory lithium-ion battery plant near Reno. 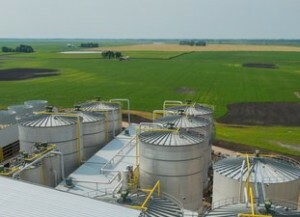 Biofuels get mixed message in Washington: Fans of biofuels got some “good news/bad news” out of Washington, DC. Last week, Bill Cassidy (R-La.) introduced a bill that would completely recall the federal Renewable Fuel Standard, with its ethanol and biodiesel blends and advanced biofuels provisions. Sens. Dianne Feinstein (D-Calif.) and Pat Toomey (R-Pa.) have made several attempts to remove the ethanol blend mandate, but leave in other biofuels, such as biodiesel. For those in the biofuels business needing funding, the federal government now is offering $100 million in grants under the Biofuels Infrastructure Partnership (BIP). That funding has been made available to support the infrastructure needed to make more renewable fuel options available to consumers. It will be administered by the Farm Service Agency; but those interested need to move fast – applications must be submitted by July 15, 2015. Continental wants to win electrified turbocharger market: Tier 1 automotive supplier giant Continental AG is throwing down the gauntlet to compete with Valeo SA, BorgWarner, and Honeywell. Similar to Valeo’s 48-volt electric motor that will soon power a new Audi vehicle, Continental is working on an electric motor to pressurize a turbocharger that will eliminate what’s called “turbo lag.” Besides bringing more power, the electrified turbocharger improves fuel economy. BMW already uses Continental turbochargers on its BMW i8 and Mini Cooper. Earlier this month, Uber celebrated its five-year anniversary since startup. CEO Travis Kalanick spoke to an audience at the company’s hometown of San Francisco and said that Uber provides more than one million rides per day, and does business in more than 300 cities in 30 countries around the world. He paid tribute to Uber drivers delivering service to riders while driving their own cars. Kalanick also ticked off a list of Uber’s contributions: less traffic congestion, cleaner air, and more jobs. The number of trips being completed each day, and the revenue coming from those trips, have been booming in growth rate this year. Uber forecasts that its net revenue, or the amount it keeps after paying out drivers, will be more than $2 billion this year. That would be five times its 2014 net revenue of about $400 million. There’s also been extremely high valuation for the company – $41 billion – placed by investors in a recent funding round. Along with competing directly with taxi and limousine services for rides, Uber is investing heavily in package and cargo delivery, food deliveries, and setting up a strong presence in China through a $1 billion investment. The company, called Uber Technologies Inc., is finalizing a $2 billion credit line with seven banks (compared to Tesla Motors’ recent addition to have access to a $750 million credit line); that five-year facility for Uber, known as a revolver, would be priced a half-percentage point lower than already competitive rate initially discussed, sources said. Analysts are pondering whether securing that large credit line from Wall Street will lead to an initial public offering (IPO) on the stock market, which that type of financial arrangement usually precedes. Kalanick didn’t mention the possibility of taking the company public during his five-year anniversary speech, but it’s possible that could be in the works. Uber also faces a huge challenge that could shape its future; that challenge comes from a California Labor Commission decision last week that an Uber worker was in fact an “employee” – and not an independent operator as Uber has argued. The ruling awarded just over $4,000 to the Uber driver who filed the case; it ties into a separate class-action lawsuit brought by Uber drivers, where a federal judge is asking the jury to decide whether Uber drivers are indeed employees. The question becomes whether Uber will be spending a lot of its investors’ money fighting these cases, or if the company will be adjusting its financial model to pay more to drivers. Uber also continues to fight the taxi and limousine industries for access to airports, and the right to do business, in cities throughout Europe and the US. Uber is taking away more business all the time from these transportation institutions. The New York Times reported that US airports are becoming more willing to try out allowing Uber and other ridesharing companies to have access to the airports – as a fee revenue source and because consumers are demanding access for Uber to drop them off and pick them up at major airports. Taxi and livery companies have been fighting ridesharing companies from having access to their markets without paying medallion and trip fees that they’ve had to pay all these years. Analysts warn Uber and other ridesharing firms about the liability issues they’ll face if there are a few serious collisions caused by Uber drivers that lead to class-action lawsuits. San Francisco has been a hotbed of new transportation technologies and business models. Two other ridesharing (or sometimes called “car-hailing”) service providers, Lyft and Sidecar, also started up in that city. Carsharing services have also taken off in that metro area, along with electric vehicle adoption. All of this seems to come from the influence of Silicon Valley, and from area residents who prefer BART rides and transportation alternatives over having to take taxi rides or driving their car into a city where it’s extremely difficult and expensive to park. Uber says that about half its trips in San Francisco are ridesharing transactions, where passengers can save money on the trip by sharing the ride with somebody they don’t even know. Drivers must be willing to have somebody riding in the passenger seat next to them, and have two-or-three people riding in the backseat. Millennials (late teens to early 30s) are extremely pragmatic about transportation: They make up the vast majority of Uber’s customers. Unlike previous generations, Millennials are not as likely to get their driver’s license on or near their 16th birthday, and are tending to move into cities for work and lifestyle choices. Millennials are much more interested in getting a ride from a friend; taking a bus or train ride; walking; riding their bike; or whatever may make the most sense at that time and place. Many of them like the ease of use and coolness of using Uber – it’s right there on your phone and picks you up in five-to-10 minutes. Why ever take a taxi ride again? 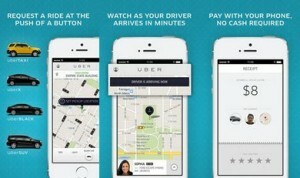 : Getting a ride with Uber is about half the price of a taxi ride. You can do it quickly on your mobile device rather than booking an hour or so ahead of pickup, which is typical for taxi rides. Uber is ready to pay the driver automatically, once the passenger has set up their Uber account. Taxi riders pay for the trip using a card swipe in the back seat, which adds to the process and asks the question of whether or not you want to tip the driver. Uber riders are reassured that tipping is not a requirement. Uber passengers tend to like Uber drivers more than taxi drivers. That’s likely why Uber, Lyft, and Sidecar all started in San Francisco – a city where residents want more cost-effective and efficient transportation options. It’s also a city that has taxi drivers known for being just as aggressive as they are in New York City, many times cutting across lanes to beat other cars through the traffic. Some Uber passengers may want to chat with their drivers, asking them what it’s like to drive for Uber and how to beat stalled-out traffic. Job opportunities in a fast-changing economy: Uber is exploring entry into other market segments like a food-delivery service (UberEats) and package delivery (think FedEx and UPS) that would probably need employee drivers; or independent contractors working structured schedules very similar to what employee drivers are given. For now, Uber drivers (which they call “Uber partners”) are independent contractors driving passengers in their own cars and paying all the operating costs. That may be changing in the wake of the California Labor Commission ruling, but for now self-employed Uber drivers are doing the work. Uber drivers appreciate the opportunity to make side income, and sometimes full-time income, in a job market different than it was just a few years ago. Some of these drivers have been laid off jobs in recent years or had their job duties increased in a reorganized work environment. They appreciate the flexibility and choice they’re given driving for Uber. One of Uber’s recent cable TV commercials shows the benefits drivers can gain, such as a mom picking up kids after school or a musician gaining extra time to practice for that next gig. Research firm Benenson Strategy Group released study findings in December on Uber drivers showing that the drivers’ major reason for working with Uber is because it allows them more autonomy. Nearly nine out of 10 Uber drivers report that “being their own boss” and being able to set their own schedule was a primary reason they’re driving for Uber. The study also showed that the drivers are in a different generation than their passengers. More Uber drivers are over 50 than are under 30. In today’s work environment, employees over 50 are finding that there’s more pressure to retire, or are facing layoffs to make room for younger employees costing the company much less in labor expenses. That’s been in the works for several years – driven by globalization of the economy, advanced technologies changing the very nature of the work environment, and a heightened demand being made for increased profitability and efficiency – as taxi drivers are experiencing while Uber takes more of their customers away. Ubiquitous in media coverage and in conversations: In a tribute to retiring late night talk-show host David Letterman, TV star comedian Ray Romano said that without appearing on “The David Letterman Show” in the 1980s, he would have never made it. “Without that moment, I’d be your Uber driver today,” Romano wrote in The Hollywood Reporter. It’s very common to hear pithy and iconic references to Uber these days during conversations you might listen to at the next restaurant table. It’s becoming nearly as pervasive as references to Tesla CEO Elon Musk being the cutting-edge technology guru of the day. Uber represents seismic shifts in lifestyles and mobile apps – and for many users, there seems to be enthusiasm and pride in being part of a revolutionary transformation in transportation and what’s called the “sharing economy.” Uber passengers tend to know about related services like Airbnb, a digital platform allowing customers to stay at someone’s house for a cheap price instead of having to pay more to stay at some name-brand hotel location. Uber passengers get to save money on transportation during a time when many of them are questioning whether or not to own a car now that they live in the heart of the city. 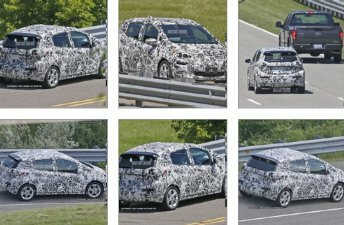 The Chevrolet Bolt electric vehicle, which grabbed eyeballs during its unveiling at the Detroit auto show as a concept car, was the subject of spy shots last week. A spy photographer took pictures of the Bolt on a test track in the Detroit area. The 200-mile range Bolt hatchback is expected to start production in late 2016 at General Motor’s Lake Orion assembly plant, for market launch in 2017. Shown off originally with its sunset-orange paint as a concept car, the spy shots show this test model has been painted in the camouflage style commonly seen on test tracks in recent years. The exterior paint makes it hard to see all the details, but there is one slight difference from the concept car – a black roof-mounted wing. There might also be some new lighting elements near the rear bumper. The price of the Chevrolet Bolt is expected to be around $30,000 after a $7,500 federal tax credit. Rethink Methane Symposium took place for the first time last week in Sacramento. Presented by ACT Expo organizer Gladstein, Neandross & Associates, the symposium featured stakeholders in the natural gas, bioenergy, solar, wind, hydrogen, and fuel cell industries. Panel speakers explored how renewable methane from biological and synthetic sources can help California meet its climate protection and air quality improvement goals. Speakers included California Senator Fran Pavley, who co-authored California’s AB 32 and chairs the Select Committee on Climate Change and Assembly Bill 32 Implementation; California Senator Ben Allen, sponsor of a bill to establish a renewable gas standard for California’s gas utilities; and Peter Lehner, executive director of the Natural Resources Defense Council. One of the themes of the symposium was the importance of having policies and incentives in place to accelerate production of renewable methane from a variety of sources including organic waste, landfills, and wastewater treatment plants. Honda committed to hydrogen, leaving natural gas: Honda will be bringing its first production scale hydrogen fuel cell vehicle to market in 2016, while also stopping production of the Honda Civic Natural Gas. That alt-fuel car was introduced in 1998 and has only seen 16,000 units sold since then. John Mendel, head of US sales for American Honda, says that gasoline prices being down influenced that decision. Mendel also said that the Honda Accord plug-in hybrid will go out of production and will be replaced by another plug-in hybrid by 2018. More “new energy” cars coming to China: Guangzhou Automobile Group Motor will be investing about $322 million in a factory in China that will exclusively build green “new energy” vehicles; details on what technology will be used haven’t been given. The company, a subsidiary of Guangzhou Automobile Group, currently sells hybrid and range-extended electric versions of its GA5 sedan, with a hybrid version of its GS4 SUV scheduled to be launched next year. China’s “new energy” policy is aiming to clean up increasing air pollution in its cities, with green vehicles making for a big part of it. EcoCAR 3 year one winners named: Ohio State University has taken the top spot in Year One of the EcoCAR 3 competiton, according to co-sponsors, the US Dept. of Energy and General Motors Corp. Virginia Tech and the University of Waterloo took second and third place respectively in the first part of a four-year collegiate engineering programs where students have the opportunity to design, build, and demonstrate clean, advanced vehicle technologies. This time, all the teams are working on conversion projects built on the 2016 Chevrolet Camara. VIA Motors gains CARB and EPA certifications: VIA Motors announced that its plug-in hybrid Chevrolet Silverado has been given emissions certification by the California Air Resources Board (CARB) and by the US Environmental Protection Agency (EPA). The plug-in Silverado pickup truck has a 40-mile battery range and averages 100 mpg in typical daily driving, VIA says. Having a big fuel tank (16 gallons) allows it go an additional 400 miles of gasoline and electric miles. Nissan sponsoring National Drive Electric Week: Nissan just made an agreement to be the national sponsor of the annual National Drive Electric Week for the next three years. The Nissan Leaf continues to be the highest selling electric vehicle ever, now closing in on 200,000 global sales since its introduction in December 2010. This year’s National Drive Electric Week, (an education, public awareness, and driving event) will be taking place Sept. 12 through 20. General Motors entering energy storage market: While Tesla Motors is now entering the stationary storage market, GM’s strategy deals more with the classic question: What do you do with those expensive plug-in battery packs once they leave the vehicle? GM will soon be announcing its strategy for secondary use of its electric vehicle batteries. Three years ago, GM and Swiss engineering company ABB tested and showed off how they could take batteries from five Chevrolet Volts and convert them into a modular unit capable of providing two hours of electricity to three-to-five American homes. DOE aggregate purchasing program: The US Department of Energy is moving its aggregate purchasing program forward by making up to $2 million available. The funding is designed to support its aggregate purchasing plan, when one central organization coordinates customers to maximize their collective buying power. It’s been designed to support increasing sales for plug-in electric and other alternative fuel and advanced technology vehicles, subsystems, components, alternative fuels, and refueling/charging infrastructure. ‘Socially responsible’ charging stations: Social responsibility is resonating deeply within corporate America, and that might be a good vantage point to bring to the electric vehicle charging infrastructure, adding it to the list with environmentally responsible, really-cool technology. Volta Industries is using it as the model for building a network of 100 public stations that offer free charging. The company has secured an additional $7.5 million in funding to expand its operations, and has so far brought in Macy’s, Whole Foods, and the Sungevity solar company. Volta was founded in 2010 and began offering free public charging in Honolulu; since then, the company has expanded to San Francisco, Los Angeles, San Diego, and Phoenix. Tesla Motors and its CEO Elon Musk had another week of heavy media coverage – with more being revealed on the upcoming Model X launch, Gigafactory, battery swapping, SpaceX, what shareholders want, and what Bob Lutz had to say………. During the annual shareholders meeting last week, Musk said that the all-electric Model X crossover is moving forward and will be ready for deliveries in the third quarter of this year. The company reports that orders have been placed for at least 20,000 of them. Overall, the company expects to sell about 55,000 vehicles this year, with most of that volume coming from the Model S sedan. The Model X, with its “falcon wing” doors, had a two-year delay with questions buzzing on the internet about when it would actually be rolling out. It’s expected to be offered with a variety of different battery-pack sizes and performance levels, similar to the Model S.
The Gigafactory lithium ion battery manufacturing plant in Nevada is ready to start production in mid-2016. Partner-company Panasonic Corp. has committed to sending hundreds of its employees to the Gigafactory starting this fall and will be investing around $478 million on the plant this fiscal year. 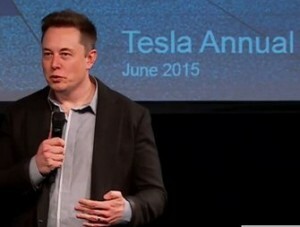 Battery swapping took another blow – Tesla is backing away. During its California test program with Model S owners, only five out of 200 who had been invited tried out the battery pack swap that Tesla had made available. It’s clearly not very popular, and it’s unlikely to be expanded in the future, Musk said. Customers seem to be more interested in using Tesla’s Superchargers that can fuel the Model S battery pack for about 200 miles of range in about 20 minutes of charging. Plus, using the Supercharger is free for Model S owners, unlike the battery swaps. As for its energy storage product, utilities and large companies are much more interested in making the investment than are consumers. The Powerpack, which will go to utilities and large industrial customers, will probably get more than 80% of the total energy sales. Based on negative feedback from consumers about the Powerwall energy storage product, Tesla is increasing the kilowatt power storage capacity without raising the price, Musk said. Two Tesla shareholders, Mark and Elizabeth Peters from Texas, want the company to stop using animal products such as leather seats. Elizabeth said her husband, Mark, had to go through “extreme measures” to get her a vegan Tesla as an anniversary gift. Later in the call, a representative from People for the Ethical Treatment of Animals asked Musk if the animal-rights group could help the carmaker find vegan alternatives to leather. “We’ll look into it,” Musk said. An “autopilot” edition of the Model S, with semi-autonomous features like a lane changer system, will be available in the near future. Being in the auto manufacturing business requires a large amount of capital. Tesla has secured a credit line of up to $750 million backed up by property, inventory and equipment owned by the company, which was disclosed in a Tesla public filing on Friday. That line of credit had been in place for $500 million, and was extended another $250 million by Deutsche Bank, Bank of America, Goldman Sachs, J.P. Morgan Chase, Morgan Stanley, Wells Fargo, and Credit Suisse. Tesla has been using up its cash reserves and needs to have access to a sizable credit line. Tesla spent more than $500 million in cash during the first quarter to bring its Model X to the marketplace. Tesla expects to see the Model X generating cash flow in the fourth quarter of this year; delaying the Model X launch again would get in the way. May sales: Plug-in hybrid and battery electric vehicles saw the start of a seasonal pattern – up for May, the first month of a strong selling period that usually extends through August. Electric vehicles saw increases over April – plug-in hybrids increased 21.1% and battery electric vehicles are up 16.9%. The Nissan Leaf, number two behind the Tesla Model S, has now seen more than 80,000 units sold in the US since its launch. The Leaf had 2,104 units sold in May and the Model S had 2,300 units sold. Sales are down about a third from a year ago for the Leaf, and trouble lies ahead when the Georgia tax credit ends after July 1.The Chevrolet Volt saw an improvement in sales – at 1,618 it was the best monthly sales figure since August. The Toyota Prius Plug-in Hybrid has been seeing a similar pattern – sales have been down in recent months with the revamped 2016 model coming out soon. Like the Volt, the Prius Plug-in had better results during May. At 727 units sold, it was the best sales month since August. EV incentives dwindling: Electric vehicle (EV) incentive programs are going away in two states, while other states are limiting funding for these programs in a climate of state budgetary restrictions. Automakers will also be facing federal tax incentives drying once they pass 200,000 units sold point for that EV. 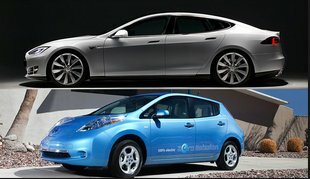 Georgia’s tax credit of up to $5,000 will end on July 1; owners of noncommercial EVs in the state face an annual license fee of $200, while owners of commercial EVs will pay $300. For Illinois, state legislators indefinitely suspended its rebate program that had provided up to $4,000 on alternative fuel vehicles including EVs; that program had given out $14 million in incentives since 1998. Last month, Connecticut started a rebate program from up to $3,000 on the purchase or lease of an eligible EV; however, only $1 million was set aside for this program, which means it may not last very long. NGVs coming back: Falling gasoline and diesel prices may have softened demand for natural gas vehicles, but that’s likely to turn around, according to a new study by IHS. The study, LNG in Transportation: Challenging Oil’s Gripsays that use of natural gas as a transportation fuel could displace more than 1.5 million barrels per day (mbd) of oil demand by 2030. The study says that it’s often more economic for truck fleets to switch to alternative fuel sources. Truck fleets have a relatively quick turnover which could lead to faster adoption of new technology. A combination of drivers – environmental, technological and commercial – will drive greater adoption of natural gas in transport, according to the IHS study. Some dealers support Tesla: Executives at publicly traded dealer groups are “quietly supporting Elon Musk,” according analysts at Morgan Stanley about the Tesla Motors chief executive. Publicly traded dealers, which were not named in the report, said they would be delighted with deregulation, which would even help their business. Morgan Stanley analysts see the “Tesla vs. dealers” battle as the first of many legal challenges to existing state franchise laws; after numerous discussions with dealers, carmakers, and fleet managers on this topic, they wouldn’t be surprised to see today’s 10,000-plus dealer groups scaled down to as few as tens of dealer groups in the future. Charging for fleets: Car Charging Group, Inc., has launched a new feature for fleet customers utilizing Blink EV chargers and Blink Network, software that operates, monitors, and tracks the Blink stations and all of its charging data. The company solicited feedback from fleet managers when creating the product and found that requiring drivers to enter odometer data before charging their plug-in electric vehicle was a control that needed to be put in place. India facing severe air pollution: While China’s megacities have been taking the rap for severe air pollution, India is facing far worse air quality. New Dehli, India, is facing air pollution that’s twice the level of what’s being found in Beijing, according to the World Health Organization (WHO). Nearly half of that city’s 4.4 million school children already have irreversible lung damage from air pollution, according to the WHO study. San Diego may see more charging: San Diego Gas & Electric is working with a group of automakers, labor representatives, environmentalists, and service providers on the utility’s proposal to substantially increase its local electric-vehicle infrastructure and incentives. The program calls for SDG&E to install charging stations for electric vehicles at up to 550 sites throughout its service territory and offer special rates to encourage use at times that are optimal for power-grid efficiency. Agencies signing on in support of the pilot effort include the Natural Resources Defense Council, Environmental Defense Fund, Sierra Club, California Coalition of Utility Employees, Greenlining Institute, ChargePoint Inc., NRG EV Services LLC, Smart Grid Services Siemens AG, Plug in America, GM, Honda, Alliance of Automobile Manufacturers, KN Grid, CALSTART, the Center for Sustainable Energy, and the Green Power Institute. The California Public Utilities Commission is expected to rule on the proposal sometime this year. Panasonic moves forward on Gigafactory: Panasonic Corp. will be sending hundreds of its employees to Tesla Motor’s Gigafactory in Nevada starting this fall, as preparation for lithium-ion battery production moves forward for startup next year. Yoshio Ito, head of Panasonic’s automotive and industrial systems (AIS) division, said the company plans to invest around $478 million this fiscal year in the Gigafactory and the company’s joint development project with Spanish auto parts maker Ficosa International SA, which specializes in advanced driver assistance systems featuring blind spot detection and assisted parking. Sending power back to grid: Electric vehicles with excess power stored under their hoods are a good source of electricity to send back to the local grid, according to Japanese auto executives. These company leaders are part of the movement supporting the CHAdeMO charging standard who think electric vehicles can be a good energy source for building, external batteries, and appliances. The strategy was unveiled during the annual meeting of companies backing CHAdeMO, a high-speed direct-current charging protocol for EVs and plug-in vehicles – and a target for competition by automakers in the US and Europe adopting SAE standards instead of CHAdeMO. “I think that’s how CHAdeMO can expand,” said Toshiyuki Shiga, CHAdeMO Association president and vice president of Nissan. Ford opening up EV patents: Ford Motor Co. is following Tesla Motors in bringing its electric vehicle (EV) technology out to competitors in the marketplace. 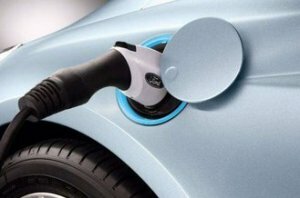 Ford is opening up hundreds of patents on the technology to automakers to help bring EVs and hybrids out for diverse vehicle offerings and wide adoption with consumers. Ford will be charging a fee for licensing its patents, unlike Tesla offering its patents for free. Ford has more than 650 patents and about 1,000 pending patent applications related to hybrid and plug-in vehicles. The automaker plans to hire 200 more EV engineers this year to further its R&D in electrified transportation. Wireless charging moving forward: Daimler AG has a partnership with Qualcomm Inc. to recharge batteries in electric vehicles, along with recharging mobile devices, using wireless charging (also known as “inductive charging”). The partnership will utilize the Qualcomm Halo wireless charging system, providing battery electric and plug-in hybrid electric vehicle drivers a way to recharge without having to plug them in; they’ll also be using Qualcomm’s WiPower technology that allows consumers to wirelessly charge smart phones and other mobile devices wirelessly inside a vehicle. Chicago Clean Cities reduces petroleum consumption and emissions: The Chicago Area Clean Cities Coalition says that in 2014 its member fleets saved more than 25 million gasoline gallon equivalents (GGEs) of petroleum and nearly 240,000 tons of greenhouse-gas emissions. “This, the coalition’s greatest achievement yet, is the equivalent of removing 3,150 tanker trucks’ worth of gasoline,” said Samantha Bingham, coordinator, Chicago Area Clean Cities (CACC). “This incredible accomplishment would not be possible without the efforts of the coalition’s stakeholders, which include commercial fleets and municipalities throughout the six-county Chicago region.” Chicago Area Clean Cities recently celebrated its 20th anniversary. LG Chem gains another battery customer, A123 doubles capacity: LG Chem is on a roll as a maker of lithium-ion battery cells for electric vehicles; Chinese automaker Great Wall Motors has been added to the list. South Korean battery maker LG Chem also provides this technology to Audi, Cadillac, Chevrolet, Ford, Hyundai, Renault, Smart, Volkswagen, and Volvo. Great Wall will use LG Chem lithium-ion battery ells for upcoming plug-in hybrid SUVs. Plug-in hybrids are considered to have the best chance of taking off in sales in the massive Chinese market; they qualify for the government’s New Energy Vehicles policy and are expected to be most popular with workers moving into apartment towers in fast-growing cities. A123 Systems will be doubling its manufacturing capacity at its three lithium-ion battery plants. Parent-company Wanxiang Group is investing $200 million to increase capacity 1.5 gigawatt hours at plants in suburban Detroit, Hangzhou, China, and Changzhou, China over the next three years. A123 Systems has changed its end product away from lithium ion battery packs to low-voltage lithium batteries for weight savings and to power other fuel efficient technologies. Ford getting into carsharing: Ford Motor Co. is following the lead started by Daimler and BMW by offering services in the growing carsharing business. GoDrive will offer one-way rides with guaranteed parking; Ford will have 50 cars available through 20 London locations for GoDrive. CALSTART continuing to administer HVIP program: California Air Resources Board has decided to continue working with CALSTART on the California Hybrid and Zero-Emission Truck and Bus Voucher Incentive Project (HVIP); CALSTART will manage $10 million in additional incentives in 2015 and 2016 – the largest state clean truck and bus incentive program in the nation. CARB initiated HVIP in late 2009, and it has become the most significant program nationally that encourages fleet operators to purchase hybrid and electric trucks instead of conventional ones, CALSTART says. Tesla shut out of Texas: Tesla Motors has been blocked from directly selling its electric cars in the state of Texas for the second time in two years. That follows strong moves that CEO Elon Musk and his colleagues have put into being allowed to sell in that large marketplace. Auto dealers have a lot of pull in Austin, and were able to recently thwart a second bill that Tesla had supported. California more flexible on ZEV compliance: While the California Air Resources Board rejected a request on May 18 to be exempted from the state’s zero-emission vehicle mandate by Jaguar Land Rover, Mazda, Mitsubishi, Subaru and Volvo, there may be a way out for them. Automakers with less than $40 billion in annual global revenue – which includes those five companies – now will have the option to sell plug-in hybrids only to earn credits toward compliance, rather than being forced to sell some battery electric or hydrogen fuel cell vehicles. If they don’t sell enough, they’ll still need to buy credits from automakers that sell electric vehicles in sizable numbers. Daimler also getting into battery storage market: Daimler AG is following the lead from Tesla Motors on getting into the energy storage market. Daimler will sell Mercedes-Benz branded lithium-ion batteries in a relationship with utility EnBW Energie Baden-Wuerttemberg AG. Daimler’s batteries have been tested for millions of kilometers through the toughest environments of heat and cold, the company said. Germany’s economy and government regulations are tied heavily into renewable energies; Daimler is hopeful it’s a smart market to move into. Plus: In this week’s Green Auto Market – Extended Edition, “What 3D printing is bringing to automakers and their engineering design teams.” 3D printing has become the “topic du jour” in the auto industry. It’s ideal for racecar teams, and for automakers looking to speed up design-to-manufacturing while cutting production costs. One reason 3D printers is taking off is that the cost has plummeted downward; new 3D printers have dropped to less than $1,000 in price. That’s how a company like Local Motors and its electric car can enter the automotive space. You can read more about subscribing to Extended Edition here.